There’s obviously nothing fearful about fried rice. In fact, it’s probably the easiest thing to start with if you want to start stir frying! Everything just works with it! I was trying to be funny with the title but I don’t think it really works. It is however really simple and everyone should try it! You can use any ingredients on hand, especially leftovers. The rice that I normally use for fried rice is usually cold and hard from the refrigerator. It’s the best kind for frying – the rice grains don’t break and are easier to stir fry. Also, you can substitute any of the ingredients – don’t add tomatoes, tofu or peas if you don’t like them. Throw some other things in them. I usually prefer them to be of different NATURAL colours just so that it looks pretty and you know the different colours represent different vitamins and minerals. Serves 4. Prep time: 5 mins. Cooking time: 15 mins. 1. Cut up tomatoes and tofu into large cubes or chunks. Then put aside. 2. Heat 1 tablespoon cooking oil in stir fry pan and brown 1/2 tablespoon garlic in medium-high heat. 3. 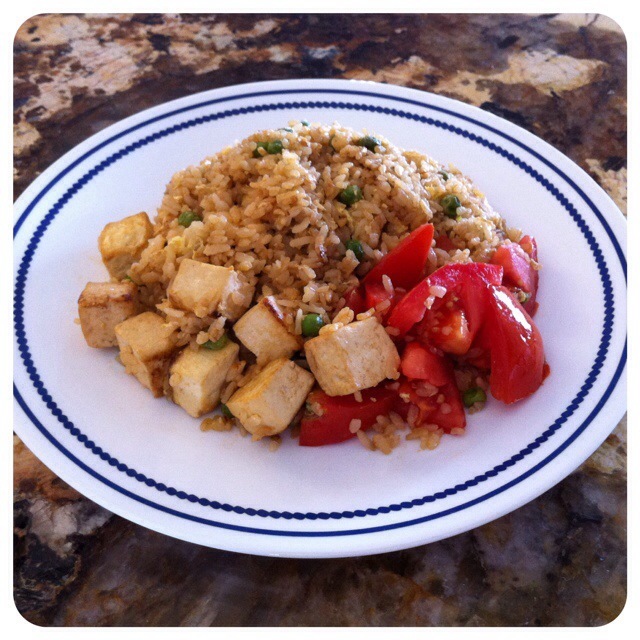 Once garlic starts to turn light brown, add cubed tofu and toss gently so they won’t break. 4. Once cubed tofu turn brown on the edges, add frozen peas (I just rinse them in tap water). 5. Turn up the heat to maximum, then toss in cooked rice (I merely removed mine from the fridge without heating them) and stir carefully, breaking up any lumps. 6. 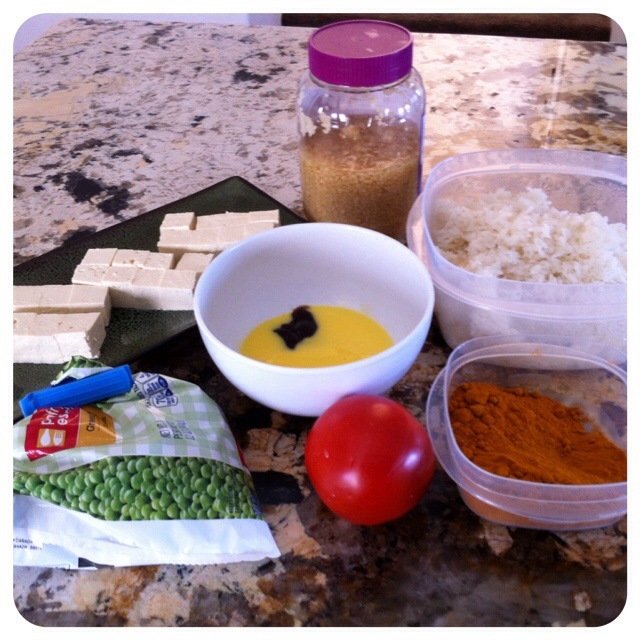 Add 1 tablespoon soy sauce, 1 tablespoon sesame oil and stir into the rice, tofu and peas. 7. Once the condiments are more or less mixed it (there will still be white patches of rice), make a well and stir in the beaten eggs with oyster sauce. 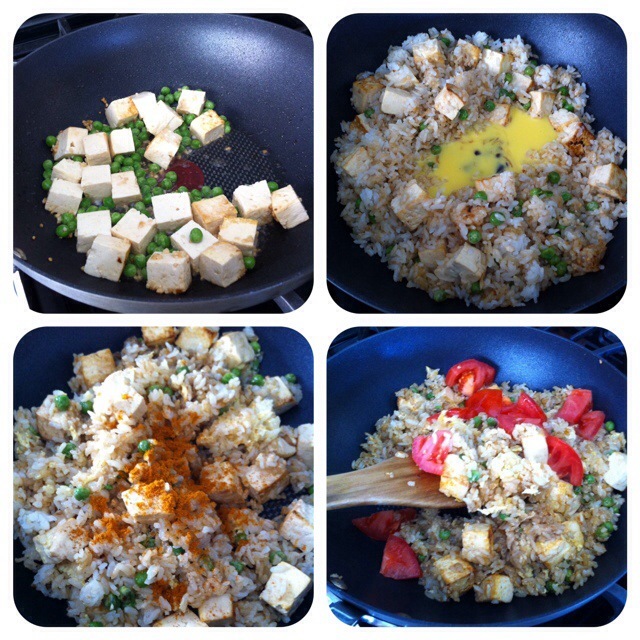 Let it sit and cook for about half a minute then mix the rice, egg, peas and tofu quickly. 8. Sprinkle 1 tablespoon of curry powder then toss the rice some more. 9. Once the rice looks more or less evenly browned and mixed, toss in the chopped up tomatoes (these should still be firm to bite when served). 10. Stir fry for about 1 minute then plate to serve. I don’t use any salt or pepper with this dish because the soy sauce and curry powder have already added enough flavour. Feel free to mix any other ingredients or remove them all. The key ones are minced garlic, the egg, soy sauce and rice, of course. Categories: Meatless Mondays | Tags: chinese fried rice, easy cooking, easy vegetarian recipes, fried rice, Las Vegas, leftovers, Meatless Monday, meatless mondays, overnight food, vegetarian cooking, vegetarianism | Permalink.